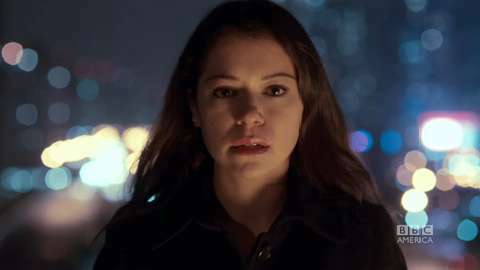 Tonight on Space, things get even crazier for Sarah (Tatiana Maslany) as she learns the threads of her own and Beth’s life are more complicated than she thought, both personally and professionally. Now, we as viewers already know Sarah and her doppelgänger are clones, we don’t know the whys though. This episode we get a little deeper into it, as it picks up exactly where the previous episode left off, with the dead German Katja Obinger in Sarah’s backseat, the rear of her head splattered across the back of the seat, and a ringing pink phone. After tending to the mess, at the urging of the voice on the other end of the phone, she returns to see Felix (Jordan Gavaris) with what she thinks is the cash she cleared out of Beth’s account… She finds an interesting surprise. Felix seeks out Mrs. S (Maria Doyle Kennedy) to reveal that Sarah isn’t dead, and to hopefully find a way for her to see Kira (Skyler Wexler). I’m of the opinion that there’s more going on with Mrs. S than we realize, I’m not sure if she’s involved in the whole clone thing, but I certainly don’t trust her. I cannot give enough credit to Tatiana, knowing the long hours she put into this series, to each scene, she imbues each of her characters with unique attributes, and the new ones we meet this evening surprise even Sarah. She cements herself not only as a strong leading lady, but an adept actress, she truly is amazing in each of her performances. Series co-creator Graeme Manson penned tonight’s episode, moving the story, and the revelations along at an almost dizzying pace, pausing long enough to allow you a quick laugh or a WTF moment before plunging right back into the ocean that is the mystery around Sarah. And while they haven’t necessarily admitted to be in Toronto yet, they do mention Scarborough and that it’s local… So that’s nice. I love thinking stuff like this could be going on in the city around me! Orphan Black airs tonight on Space!! Yeah! We’ve chatted with the cast and I’ve seen the first 4 eps, it’s a very cool show!